Matsuda S, Nishitani M, Fuchizaki U. Hemorrhagic Gastric Ulcer due to the Stagnation of Rice Cake. JMA J. 2019;2(1):95-96. A 62-year-old man visited our hospital because of epigastric pain and black stools. He had a history of successful Helicobacter pylori eradication. Computed tomography (CT) revealed a 33-mm diameter mass in the stomach (Figure 1A). Esophagogastroduodenoscopy revealed a solid, whitish object (Figure 1B) and two gastric ulcers in the antrum (Figure 1C). One of the ulcers had a visible vessel (Figure 1D), and hemostatic clips were applied. The whitish object was thought to be hardened rice cake because of its high density on CT (1) and his history of swallowing a whole rice cake one month ago. We cut the rice cake into pieces with a snare and retrieved it. Thereafter, his symptoms rapidly resolved. A freshly-cooked rice cake is soft and viscous. However, it solidifies at body temperature and may not pass through the pyloric ring if a large piece is swallowed. In the present case, the rice cake had stagnated for a month, and hemorrhagic gastric ulcers developed because of the mechanical stimuli (1). Figure 1. (A) Abdominal computed tomography scan showing a high-density mass (arrow) in the stomach. (B) Esophagogastroduodenoscopy (EGD) showing a whitish solid structure with hematin in the gastric body. (C) EGD showing two gastric ulcers (arrows) and hematin in the antrum. (D) One of the gastric ulcers had a visible vessel (arrow), and hemostatic clips were applied. S. Matsuda acquired data and drafted the manuscript. M. Nishitani and U. Fuchizaki reviewed and supervised the manuscript. We obtained written consent of the patient. Fujii M, Sakashita M, Wakamura K, et al. 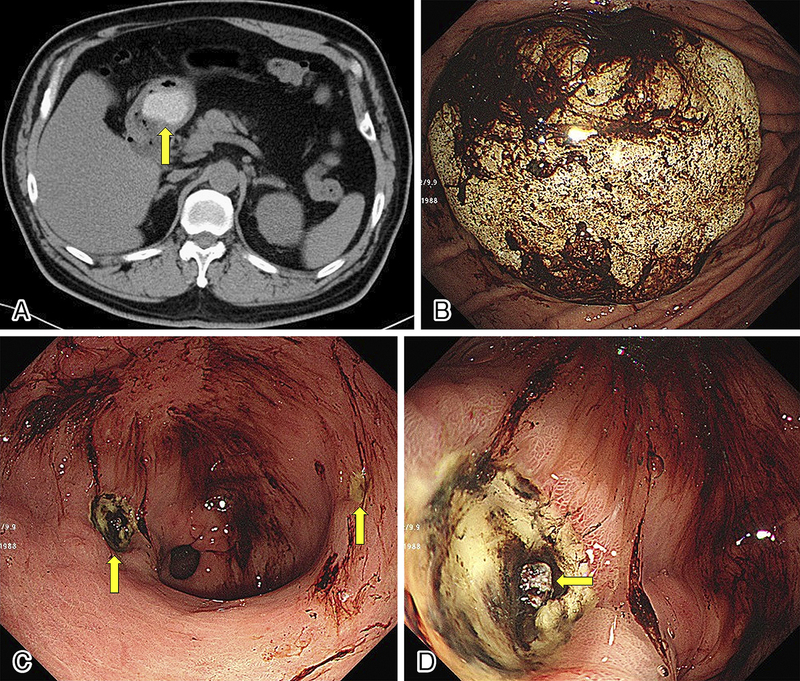 Multiple gastric ulcers caused by a rice cake as an intragastric foreign body. J Gastroenterol. 2006;41(3):282-3.